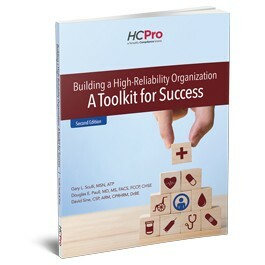 Building a High-Reliability Organization: A Toolkit for Success is a practical guide to becoming a high-reliability organization (HRO) that practices the highest standards of patient quality and care. Building a High-Reliability Organization: A Toolkit for Success, Second Edition is centered around improving hospital processes for patient safety and quality care through high-reliability practices. Authors Gary L. Sculli, MSN, ATP, Douglas E. Paull, MD, FACS, FCCP, CHSE, and David Sine, CSP, ARM, CPHRM, DrBE, look at the role leadership played in transforming their facilities into high-reliability organizations (HRO). By implementing top-down processes that translate throughout the organization, leaders can create environments that foster high reliability, patient safety, and care. Updated for 2019, the book’s second edition provides methodology intended to improve processes and standardization across organizations. Through the use of checklists, the authors demonstrate how situational awareness and structure can be created, leading to the HRO goal of preventing adverse events and errors. Additionally, the second edition includes significant new information about Just Culture, much of it based on the national Just Culture program that author Gary Sculli started in 2016. Chapter 3: Briefings (aka “Huddles”): Is Everyone on the Same Sheet of Music? Chapter 4: Yes, You Need to Use the Checklist! Gary L. Sculli, MSN, ATP, has been a registered nurse for more than 29 years and has worked in multiple clinical specialties. In addition to serving as an officer in the United States Air Force Nurse Corps, Sculli is a former pilot for a major U.S. airline. He has developed and taught Crew Resource Management (CRM) programs both in aviation and healthcare and continues to work as a patient safety consultant. Sculli currently works at the National Center for Patient Safety in Ann Arbor, Michigan, serving as the director of clinical training, where he leads programs that implement CRM, team training, and human factors concepts in clinical practice to create and sustain high-reliability care. He is also the author of the HCPro book Soaring to Success: Taking Crew Resource Management From the Cockpit to the Nursing Unit. Douglas E. Paull, MD, FACS, FCCP, CHSE, graduated from Duke University with degrees in zoology and medicine. He completed his general surgical training at the New York Hospital-Cornell Medical Center and his cardiothoracic surgical fellowship at the University of North Carolina in Chapel Hill. Prior to joining the Veterans Health Administration’s National Center for Patient Safety (NCPS), Paull was associate professor of surgery at the Boonshoft School of Medicine at Wright State University in Dayton, Ohio. He is currently director of patient safety curriculum and director of medical simulation at NCPS and has authored multiple publications on surgery, team training, and patient safety. David Sine, CSP, ARM, CPHRM, DrBE, is a former federal executive with experience in multi­ple disciplines, including enterprise risk management, organizational ethics, high reliability, and patient safety. A healthcare risk management consultant since 1980, he is a risk management and clinical ethics advisor to the National Association for Behavioral Healthcare. Certified by the Board of Certified Safety Professionals and a Certified Professional Healthcare Risk Manager, Sine has a doctorate in biomedical ethics from Loyola University in Chicago.